Rei becomes a celebrity after being featured in a magazine article, and gains a dedicated young fan called Nanako. 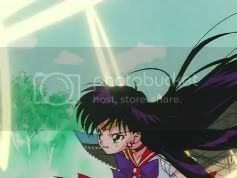 This was the first episode to feature Sailor Mars' transformation, Mars Crystal Power, Make Up, and her new attack, Mars Flame Sniper, and included the last use of Burning Mandala. This episode was skipped when the Cloverway dubbed version of Sailor Moon SuperS originally aired on Toonami. When the episode was finally broadcast, part of the battle with ManeMane Musume was cut out. This episode was omitted from the Korean dub. This page was last edited on 19 October 2015, at 05:10.